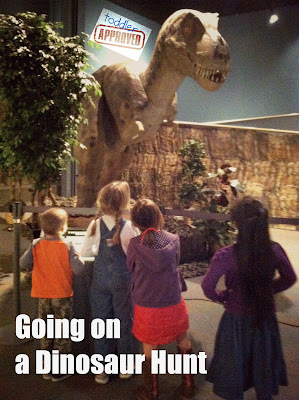 One of the things we have been "into" at our house lately is dinosaurs. We've taken out every available book in the "How Do Dinosaurs . . . ?" series from the library, and I have to return them without my son in the car (because he doesn't quite yet understand the concept of why we can't keep them forever). 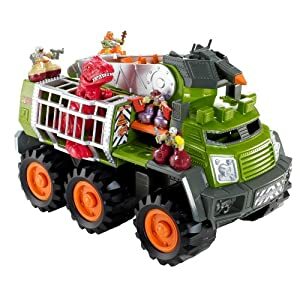 So when the opportunity came to host a dinosaur themed play date inspired by the Matchbox® Big Boots™ Ambusher, I couldn't say no. We started off the play date by doing a little "dino egg" (m&m) sorting. 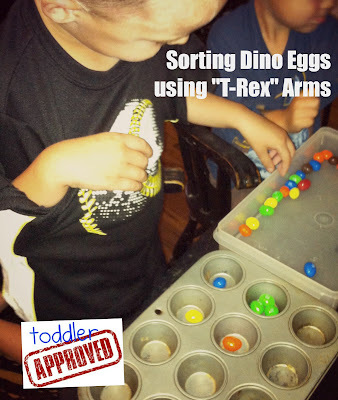 Each of the boys sorted the eggs by color, the only catch being they had to pretend they had T. Rex arms (having to keep their elbows and wrists close to their sides) the entire time. It was much easier for them to remember the "short arms" once we tucked their elbows into the armhole of their t-shirt. We next recited Michael Rosen's, "We're Going on a Bear Hunt" - but replaced the word "bear" with "dinosaur" and substituted the following for when they come upon the (bear) dinosaur in the cave, "one long tail, two big eyes, sharp pointy teeth" . . . it's a DINOSAUR". Then we went outside to recite AND ACT OUT the story again . . . and again . . . and again. My son helped me set up the scene of the "dinosaur hunt" ahead of time in one of our garden boxes (which was perfect for the activity) - but you could simply set it up in a shallow container/tub or on an old shower curtain (for easy clean up). 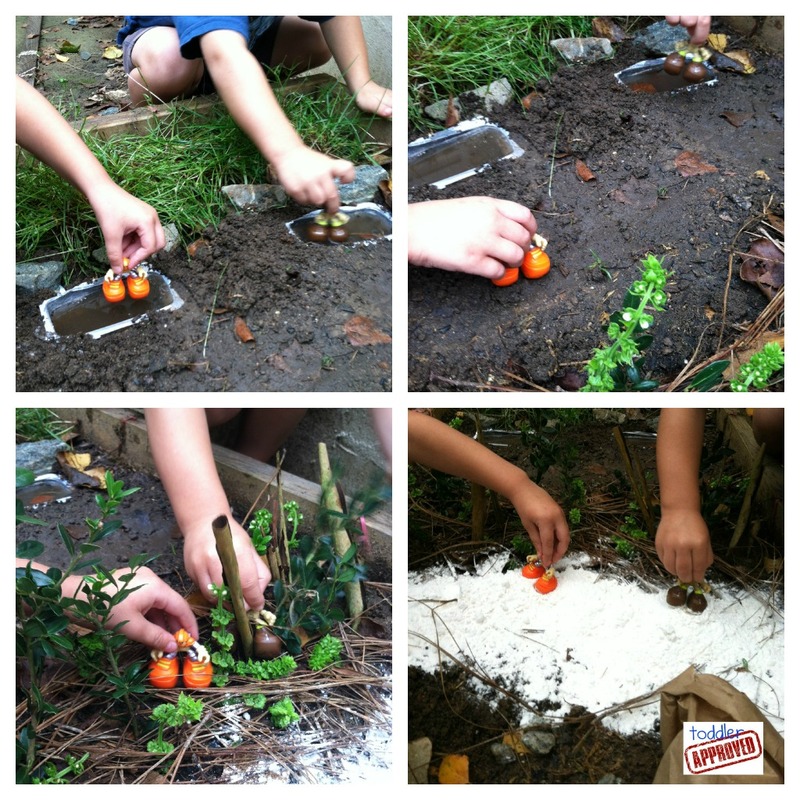 We used flour for our "snow", and crumpled up brown paper bags for the caves. 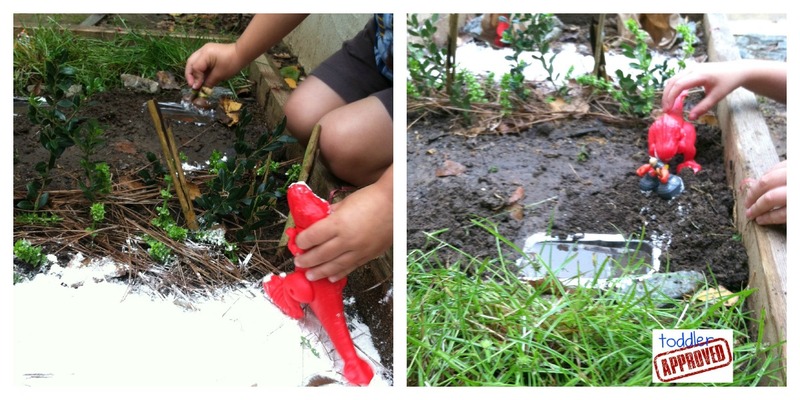 We used the Matchbox® Big Boots™ Figures as our characters, and the dinosaur that came with the Big Boots™ Ambusher. The Big Boots™ Figures are designed with weighted feet so that they will always stand - which worked perfect on on the uneven surfaces in our scene. As we moved the figures from one section to the next we would recite that part of the story . . . "uh oh! A forest. Can't go over it, can't go under it . . . ". Of course, the best part was using the dinosaur to chase the character back to safety. We repeated this, and then decided it was time to try another method to go hunting for dinosaurs - which was the perfect moment to introduce the Big Boots™ Ambusher. From this point, I just let the boys play. What a fun way this was to introduce a toy. 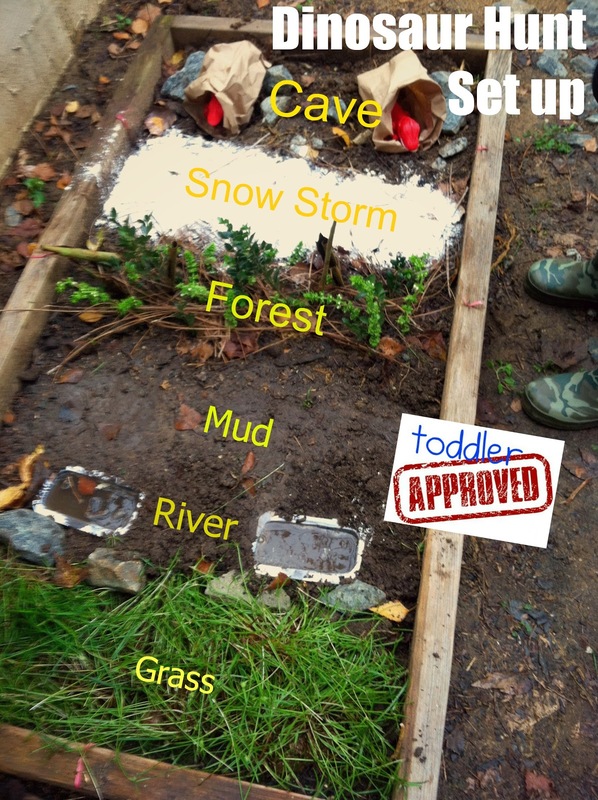 I also felt that the anticipation and excitement built up from the previous activities carried over into their imaginative play once they got the vehicle. There are very few plastic toys that I purposely bring into our house - so I was a bit skeptical prior to receiving this one. 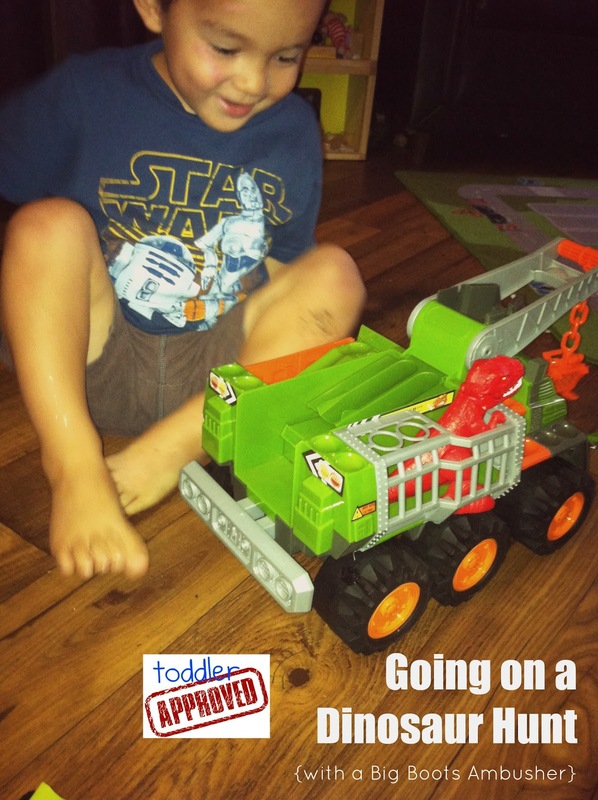 I was impressed with how many different features came built into the truck itself (doors, buttons, and things to open, close, push, pull, fling and grasp) and even more impressed that it did not come with any built in noise makers/sound effects (a great video review by DadDoes can be found here). Overall, this was a fun product which I'm sure will get some long term usage in our home. Disclosure: Matchbox® provided the Matchbox® Big Boots™ Ambusher toys used in this post for free. All posts reflect my personal opinion and endorsement and are not swayed by compensation and/or free products. Please note that this post reflects my opinion and preferences and you might not share that same opinion.